COMPANY PROFILE Finisar Corp provides optical subsystems and components that are used in data communication and telecommunication applications. It sells to manufacturers of storage systems, network equipment, telecommunication equipment and their contract manufacturers. Founded in 1987, Finisar is a California-based large provider of fiber optical modules and components that are used in data communications and telecommunications. Its products include transceivers and wavelength switches for data center interconnects, and intracity/metro and long-haul communications. Finisar sells to manufacturers of storage systems and network equipment and their OEMs, which in turn sell to telecom service providers and cloud vendors. 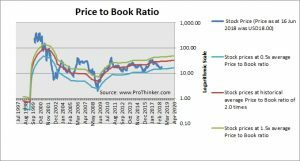 At the price of USD18.00 as at 16 Jun 2018, Finisar Corp is trading at a Price to Book Ratio of 1.2 times current book value. 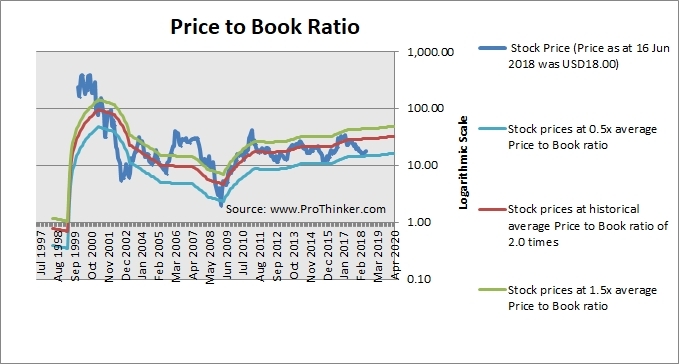 This is a 38% discount to its historical average Price to Book Ratio of 2.0 times.